Menlo is a pocket-sized research device created by Microsoft that uses a variety of sensors to create a kind of digital bread crumb-trail that shows exactly where you've been, even indoors. 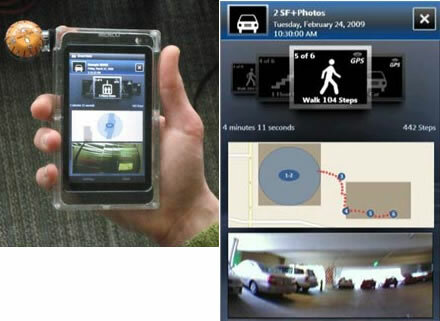 The device would collect the trail data while the user walked indoors, underground, or in other spaces where GPS signals are unavailable or weak--such as multilevel parking garages that can baffle people who forget where they parked. While existing phones contain some of these sensors, what's new about Menlo is an app called Greenfield, which aims to solve the Hansel and Gretel problem by harnessing the data from the sensors. The goal is to count a user's sequence of steps, gauge direction changes, and even calculate how many floors the user has traversed by stairs or an elevator. The app stores the trail data so that a user can later retrace his path precisely.